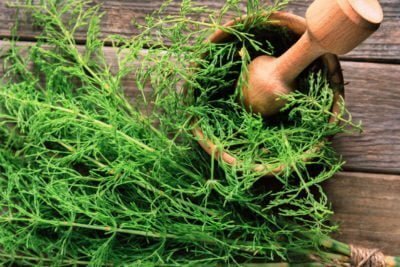 Horsetail is native to Europe and its use dates back to Roman times—the bruised plant was applied to bleeding and the young shoots were added to salads for their tonic effect. During the medieval period it was regarded as a valuable wound-healing herb, being very powerful at stopping bleeding, either inward or outward. Directions: Place the above herbs in an airtight container, mix well and store the mixture in a dark place. Infuse one heaped tsp of mixed herbs with one cup of boiling water for approximately three to five minutes and strain. Drink 3 cups a day, the first on an empty stomach.